I’m American. I’m not afraid. I’m more likely to die by furniture than terrorism. I can’t say that the news of the extensive NSA snooping is shocking, and frankly not totally surprising. What I can say, is that it’s time for a change. We must consider how America has changed, and if it is what we want it to be. America can be great. In fact, America is great. What America needs now is to be better — to be a true leader. I am compelled to take to writing because I am positive that we can be better. I know we live in trying times, I know there are no easy decisions. I also know that now is the time to take the right path. It is time to take the high road, and lead the world into a new era. It is our time. We’ve spent more than a decade being afraid. We’ve written a blank check for the War on Terror, and it’s due time that we reassess whether all of those decisions are in our best longterm interest. I realize this is a sensitive subject — I know that there are many smart and hardworking people doing the best they can to protect us. Do not confuse me with being “soft on terror”, I’ve come to these realizations exactly because I am strong on America. So, first of all, let me assert my firm belief that the only thing we have to fear is…fear itself — nameless, unreasoning, unjustified terror which paralyzes needed efforts to convert retreat into advance. America has faced massive adversity in the past dozen years. However, it is becoming painful apparent that our inability to accurately judge the cost of the War on Terror is slowly draining us of what it is to be American. You could take a look at how Associated Press reporters call records are being targeted. Or how every day that Guantanamo Bay is open and we have fathers, brothers, and family members locked away — is a day that we tarnish our reputation, alienate the world and endanger all Americans. Collateral damage of military conflicts is burning an image of violence and American aggression into the witnesses and survivors. We measure our costs in American dollars and American lives, and this view is limiting us. The 9/11 attacks cost roughly $500,000. If our response is an arms race where we outspend 1,000:1, our only destination is bankruptcy. The world is not us vs them, it’s not good guys and bad guys. This view can be extremely toxic and risks de-humanizing other nations and people. We’re all human — we share the same needs and the same planet. The world is shades of grey and overzealous reactions risk alienating huge swaths of the world, not just for today but for decades. I’ve grown up surrounded by this “new reality” and it’s admittedly difficult to come to understand that the intention of terrorism is to terrorize, to get within ones mind and fears. Viewed with this understanding, our reactions have largely played directly into the hands of the September 11 attackers. We haven’t destroyed them, we’ve created tributes in the form of the Patriot Act and security checkpoints, secret court orders, disallowing photography, and barring liquids on planes. There is little more core to the American belief than “Checks and Balances”. It seems blindingly obvious that intentionally shielding programs like PRISM from the American public, and decisions made in secret validated through secret approvals and courts run diametrically opposed to this foundation in what America is. You might be thinking “if you have nothing to hide, don’t worry”. I can’t blame you for thinking this, it certainly would be easier, but sadly it’s not true. I’d like to point out that Hoover and the FBI tapped Martin Luther King Jr, and told him to kill himself. The ability to systemically profile on a large scale is not good for anyone. I like this description of why “metadata” matters. I do not believe that these changes will happen overnight. Nor do I believe that we have a perfect solution. I know that we need a course-adjustment, that we need to return to what makes us great. I believe that programs like PRISM need to be made transparent to and evaluated by the American taxpayers who fund it. I believe that transparency has to be the default, and that as long as large scale secrecy exists, it will be exploited. Let’s change, starting today. Seriously reflect on what you think and why. Write about it. Talk about it, this is a mainstream problem, it impacts everyone whether we like it or not. Put whatever your skills are to use. The privacy problems we face are not insurmountable and virtually everyone can do something about it. This is different than things I usually post about. There have been some exciting developments on my other projects and I hope to post on those soon. 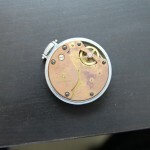 While cleaning out some old family items, I recently came across a few pocket watches. 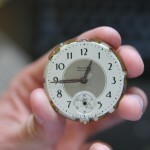 I was immediately drawn in by this piece: a Westclox Pocket Ben watch. I was intrigued in no small part because it is a dollar watch; a category of watch targeted the average person. A slight personal fascination with mechanical watches helped too. We often talk about the democratizing potential of new technologies. I don’t have much personal context on this beyond the information age of smartphones and the Internet. However, were I a betting man I’d wager this effort to democratize technological advances is far from new. 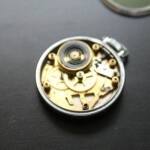 I think mechanical watches are both a historical example of this and the pinnacle of their era. 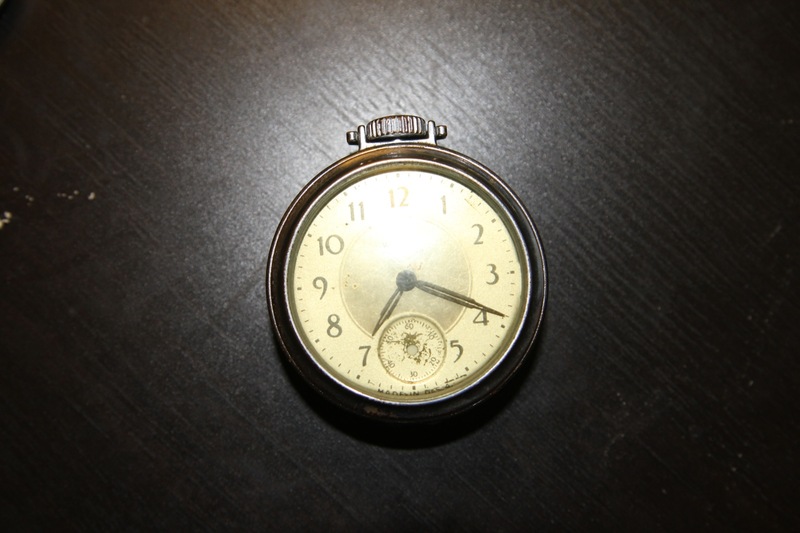 This watch was stamped “38” on the movement, signifying it was made in 1938. There is no magic. 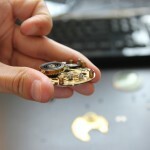 The internals of the watch expose its secrets, gears and springs mostly. 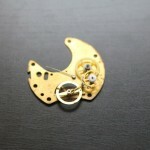 Watches are assembled by hand, therefore they can be understood with eyes and manipulated with hands. Be discerning: trust your hands, don’t be forceful but the pieces sometimes need caressing. 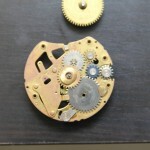 Westclox took a number of shortcuts to save money, particularly leaving the spring exposed, and sometimes replacing gears with pins that are distributed to fake acting as gears. Despite being relatively low cost and a few shortcuts, the work is honest, glue was avoided oil minimal and tolerances respected. The balancer is attached to the back of movement, which means the watch basically has to be assembled from the back forward. It would have been nice to learn this one earlier than being one step away from back together. 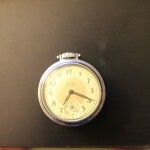 There is a small online community interested in watches like these (surprise, online community). 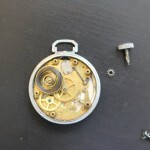 One particularly helpful source was two videos showing a very honest dissection and assembly of these watches, the videos highlight the creators thoughts and frustrations. He clearly has much more experience than I with watches and tools that are better equipped. I would be curious to know more about these watches from a historical perspective. I think it would also be particularly interesting to do an interview with people who worked on devices like this. Semi-specialized hand labor was a trademark of 20th century industry and is quickly fading. 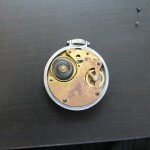 I imagine the story of watches like this will fade unless recorded soon. I liked this page showing some the various Westclox Pocket Ben watches. 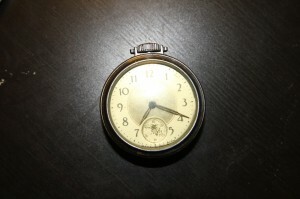 The watch I have pretty clearly is closest to the advertised 1933 watch, which matches the printed 1938 date. 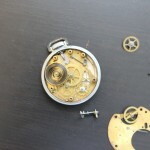 I unfortunately didn’t finish reassembling the watch. I was one step away from having it back together when I realized that the balancer must be integrated much sooner. This resulted in me assembling in the opposite direction and unable to finish in the time I had allotted. I hope to someday have a chance to revisit this. I recently needed to wipe an old hard drive. I knew that one recommended way to do this was to use something like DBAN. However, what I didn’t know was that many-pass intensive disk over writes wasn’t the only way to wipe data. Since 2001, there has actually been an ATA standard known as “Secure Erase”. 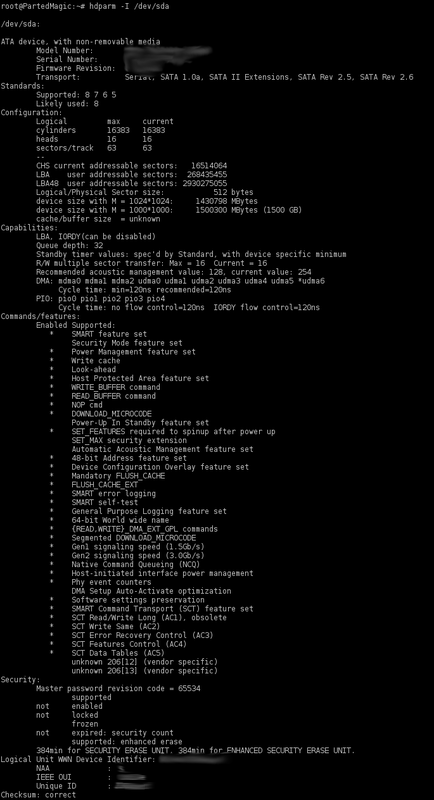 This operation is within the firmware of the hard drive and will perform an exhaustive overwrite, without burdening the computer. 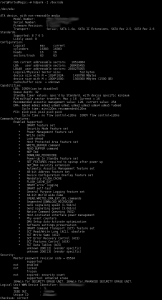 It hits sectors of the disk that an overwrite might traditionally miss. Additionally, it proceeds very quickly. NIST research has found this to be effective. 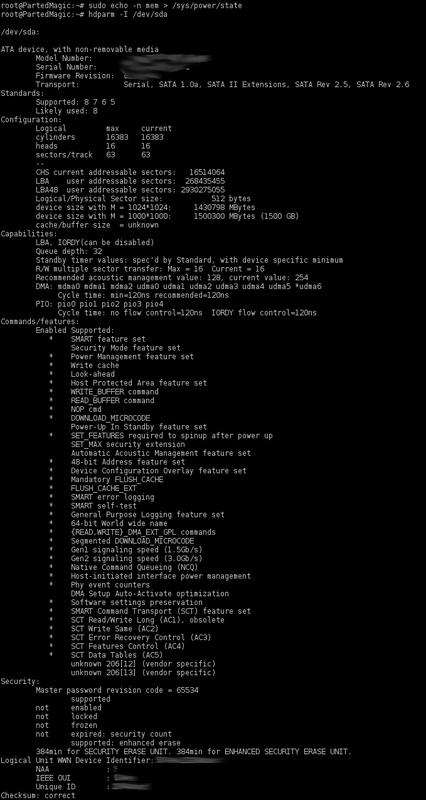 You will come across mentions of Secure Erase a lot in relation to SSD’s. I believe this focus has come from the fact that disk overwriting is widely accepted, and people are looking for alternatives that apply to modern SSD’s. However, that’s just a personal conjecture. I’ve heard conflicting evidence whether Secure Erase works for USB drives. If you know/find out, please let me know. Below is the process I followed. It was guided largely based on this guide. This article helps you clear all of the data off of a disk, I take no responsibility for anything you do with this information. Please, be very careful when you are attempting to wipe hard drives. Make sure all information is backed up. Additionally, I make NO GUARANTEE about the permanence/effectiveness of this method. Boot into that usb drive. Ideally it will now show “not frozen”. If the drive still shows frozen, ensure that you don’t have any sort of bios password locking on the drive, and then the next best option is probably to move the drive into a different computer. 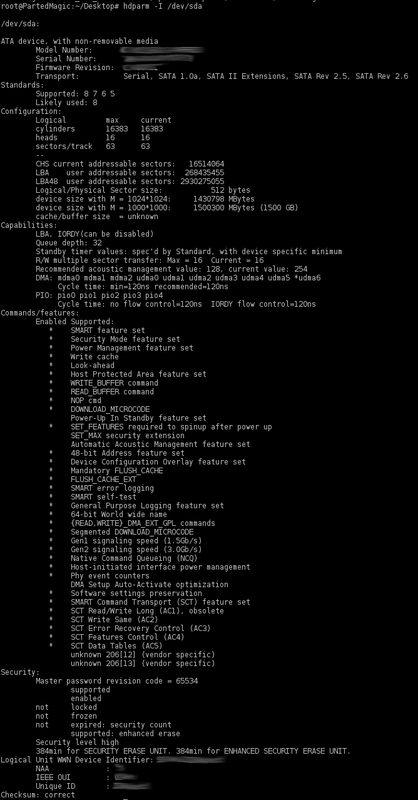 We can again run the informational hdparm command. Now we should see “enabled” in the security section. Bingo. We also see the estimated time to wipe the drive. In this case it said 384 minutes. Relax. Go do something else for awhile. We can see that my drive ended up taking 299 minutes. Has an application that can also call this ATA method. It looks like Gmail might be in the process of changing the DOM layout for the site somewhat extensively. It appears that it is re-architecting some of it’s top level elements that will almost certainly break my extension among many others. As I find out more and am able to address what the issue is, I will post what I find.